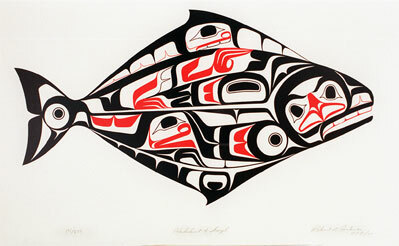 Tsimshian silkscreen print, Halibut and Eagle, by Robert Jackson, 1979. RBCM 16292. For coastal First Nations, the ocean is the primary place of food and resources, trade and transportation, history and spiritual beliefs. This is a photograph of a Nuu-chah-nulth modern whaler's hat with whales and human hunters in the design. This is a photograph of a KwaKwakawakw bowl in the form of a sea otter with a sea urchin on its chest by Henry Hunt. This is a photograph of a Kwakwakawakw Salmon mask by Richard Hunt. This is a photograph of a Heiltsuk Black cod mask.